It's been a long time since I read a paperback book. Whilst I was travelling my Kindle was my constant companion, mainly because you can get so many books on there, including lots of free classic novels, and as usual I overbought so ended up still reading the things I'd taken away with me for some time after I came back. However, a couple of weeks ago my lovely fiance bought me a copy of Tom Cox's Talk To The Tail, and it recently graduated to my work bag for reading on the train. For those of you who haven't heard of Tom Cox, he's a freelance journalist who's found fame through the lives and adventures of his many cats - the Twitter feed @MYSADCAT, about Tom's 16-year-old cat The Bear, is both funny and utterly heartbreaking. Talk To The Tail is his second book (the third, The Good, the Bad and the Furry, is due out next month) and is a mixture of observations about the cats and accounts of other animals in his life, including his dad's slight obsession with various stuffed creatures from the local community college, Tom's various horse-riding experiences, and a highly enthusiastic spaniel named Henry. Much as I adore The Bear, it was really nice to read some more about Tom's other cats, as although they do occasionally appear in the Twitter feed you don't really find out that much about them. In this book The Bear very much took a back seat and the other cats and animals came to the fore, which was quite a nice refreshing change of pace. Granted there were places where it felt a bit disjointed, but I think that's just as it's structured as a series of essays rather than a coherent narrative, and in a way that made it a perfect train book as it was easy to dip in and out. It's got a very light and self-mocking style but when the tragedy comes at the end - and in this context it is very tragic - it hits you full on and is actually quite saddening (though I should stress the book ends on a hopeful note). Overall, this was a great, easy quick read and definitely brightened up my train journeys to and from work last week by frequently raising a smile and a chuckle - it was a great antidote to the seriousness of Middlemarch. Definitely recommended for anyone who loves animals, but particularly for fellow cat people. If you'd like to read Talk to the Tail, it's available for £3.49 on Kindle or £5.24 in paperback via Amazon. 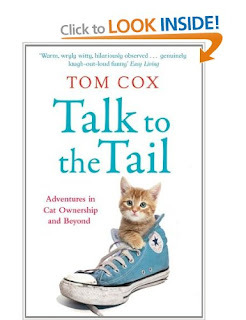 Have you read Talk to the Tail or any of Tom Cox's other books? Do you follow @MYSADCAT on Twitter? And what are your other favourite (ficiton and non-fiction) books about animals? Let me know in the comments and have a great day!